THE COUNTDOWN is on to Cancer Research UK’s Race for Life in Cardiff. With just two weeks to go until the big day, organisers are rallying local women to join the fight against cancer as fewer women than expected have registered for the life-saving fundraiser. Organisers are calling on mums, daughters, sisters and friends to show their support and take part in the 5k and10k events at Blackweir Fields, Bute Park on Sunday 16 July. 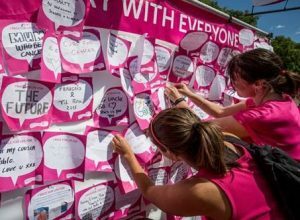 Sophie Heath, Event Manager for Race for Life in Cardiff, said: “We are absolutely thrilled that over 3,000 women have entered Cardiff’s Race for Life. But we still need more women to come forward, sign up and help beat cancer sooner. So we’re urging anyone who has been thinking about taking part to join the fight and sign up today. “Everyone is welcome and it’s still not too late to enter. This is a call-out to remind the women of Cardiff just how important their participation and contribution is. Regional Science Spend paragraph: Cancer Research UK’s life-saving work relies on the public’s support. Thanks to the generosity of its supporters, the charity was able to spend around £4 million last year in Wales on some of the UK’s leading scientific and clinical research – helping more men, women and children survive. Sophie added: “Race for Life events are non-competitive and participants can choose to walk, jog or run around the course. Whether they’re planning a 5k amble with friends, a 10k sprint or a mud-splattered race around Pretty Muddy, every step participants take will help to bring forward the day when all cancers are cured.